The long awaited post. 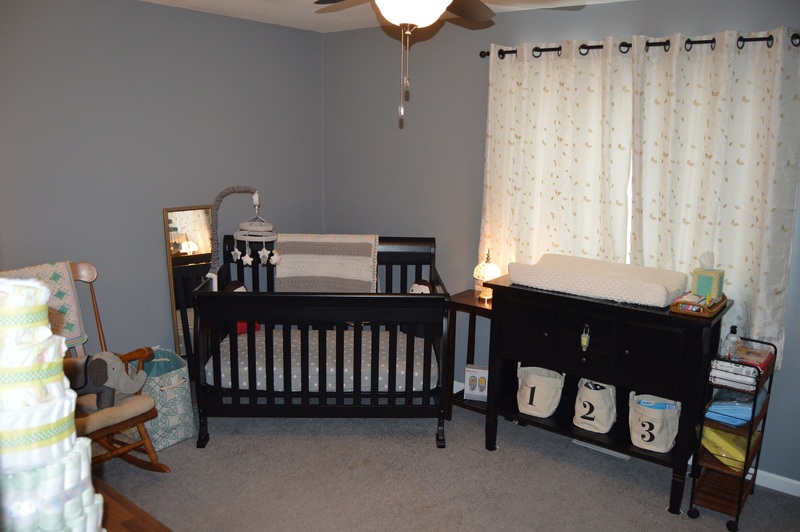 A glimpse into the nursery that is about 98% complete! Right now it looks nothing like this as I had a shower at work yesterday and the room is full of stuff again! Where oh where to put everything! The room basically centered around the Changing Table which is actually a Kitchen Buffet I found on Craigslist back in August! 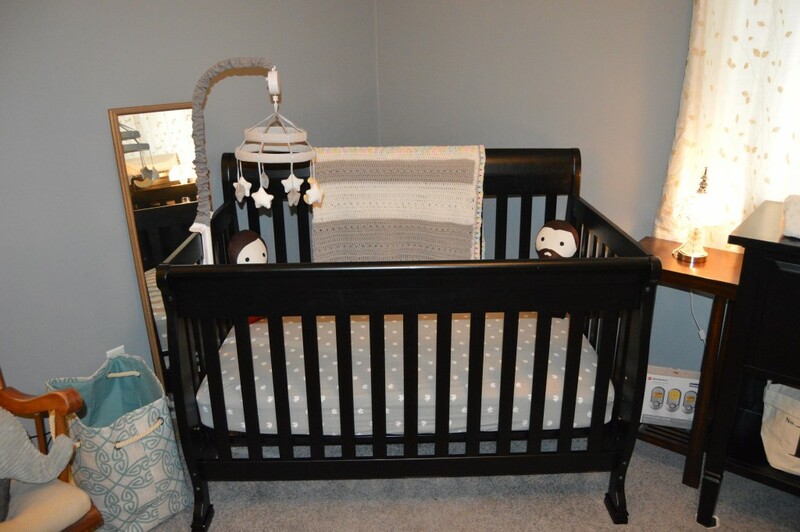 I had plans to paint it white, but after determining it probably wouldn’t accept paint very easily we decided to keep it black – this was the main item the nursery was built around! Since this room used to be our spare/guest/work room, there was alread a built in desk which Kevin made when we first moved in. Instead of ripping it off the wall and having to do more work than necessary, we decided to use it as our “dresser” and hold baskets for clothing and any other item we find would work. It doubles as a nice space to store things underneath as well. Currently, we’re storing the Rocker/Walker and the Baby Einstein Activity Table. The diaper cakes were from my shower and I plan to break those apart as I need them before opening any packages. 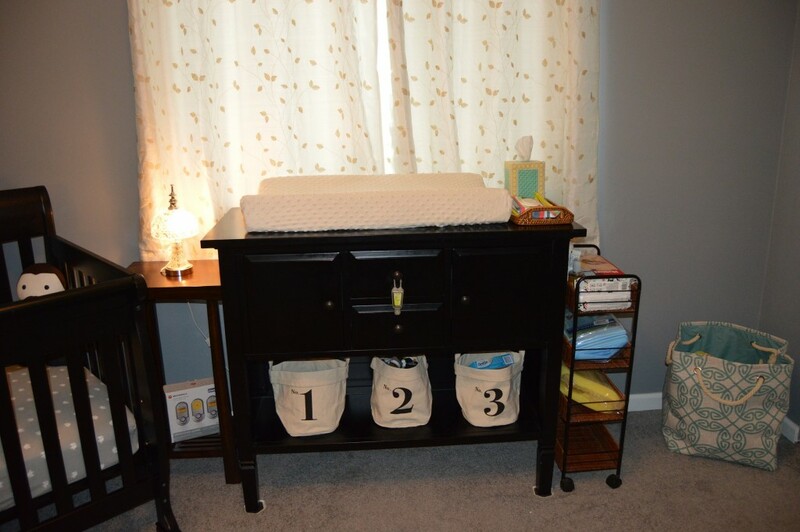 The area on top of the desk will be used for storage…here I have small size onesies and pants in one, burp cloths and swaddles in the middle and blankets/crib sheets in the third. Baskets came from Pier 1 about two years ago and have been in the linen closet for organization. 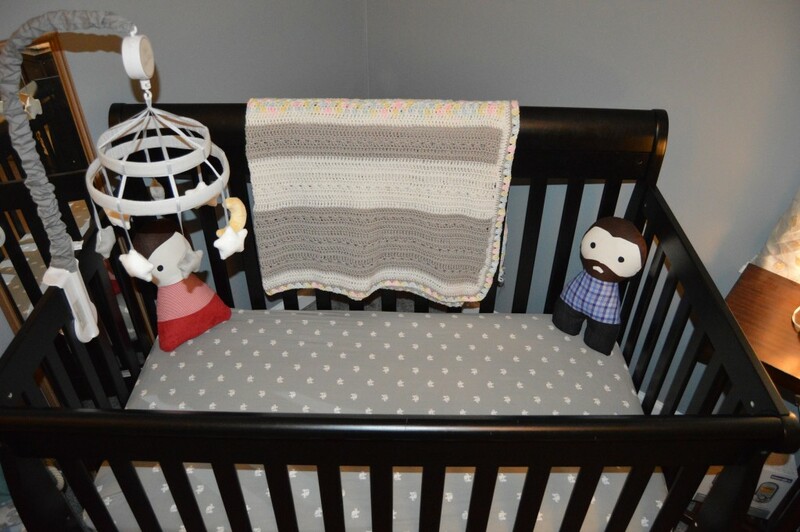 I think they work perfect in the nursery! For the life of us, we could not decide on a proper rocker/glider and I just can’t see spending upwards of $300 for one that I may not even like! This came from my Grandma’s house and, with the help of Kevin’s Uncle, they restored it and I like it just fine. I just need to find a nice cushion and ottoman for it. 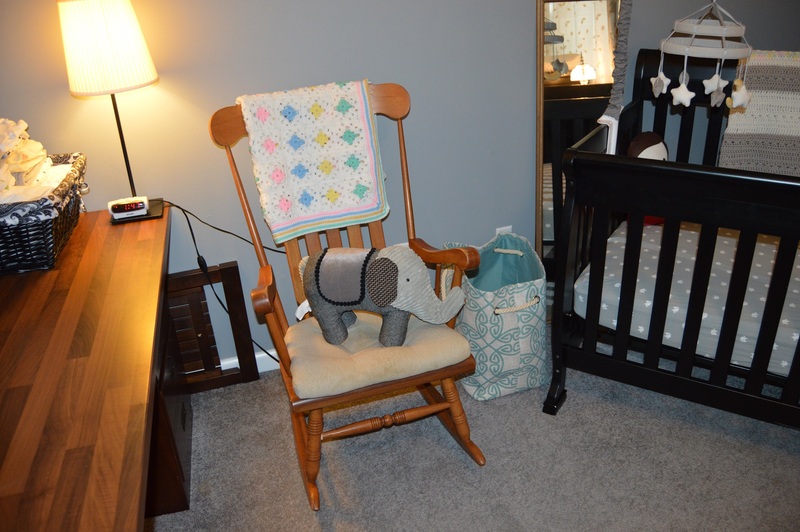 Ellie the Elephant was one of my FIRST purchases for the Baby when I found out I was pregnant. I knew I wanted Grey walls and I thought it would be so cute on the floor in the corner. This little guy came from Pier 1 over the summer! Canvas tote – found at TJ Maxx I am currently using for extra blankets at the moment. I have one on the other side of the room to hold toys and stuffed animals once our collection grows! Bins and baskets are the best way to keep organized in my opinion. I purchased these in January and I am so glad I scooped them up! The afghan was handmade by my Grandma MANY years ago before she passed away. I have stored it away waiting for the day I finally get to use to for my little one! I wish everyday she was here to see her Fourth Great-Grandbaby come into the world! My very talented Cousin sent me these adorable Kevin and Danielle dolls that she made for my shower. They are just absolutely hysterical and I just love them. Afghan pictured is another handmade beauty from Mem (Kevin’s Mom). She made this and gave it to us at the Baby Shower. 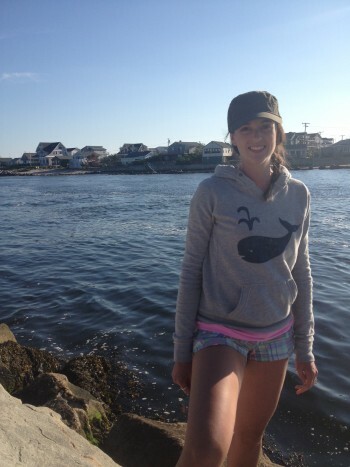 I love the Grey portion and the subtle little pops of color – Zoe likes this one too! 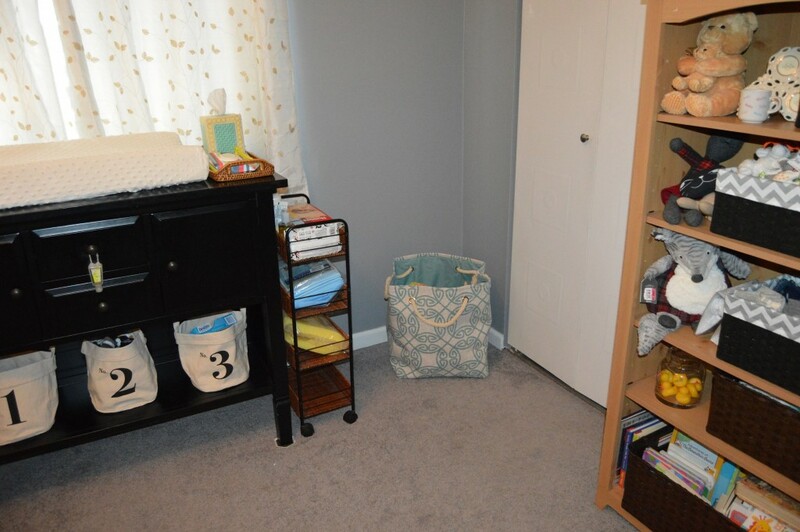 The canvas buckets were another item that I KNEW I wanted in the nursery for storing things. I love Maika Goods and have mentioned them in other posts. The wicker cart, also from Pier 1 many moons ago, was at my parents house until my Mom decided she didn’t want/need it anymore. Finders keepers! 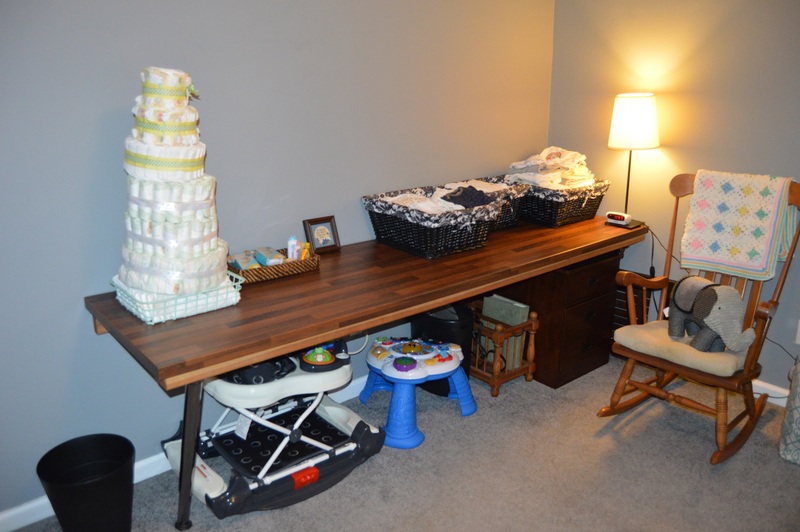 Table on the other side of Changing Table from Pier 1 as well a few years ago! Right now we have a tiny lamp on it. As mentioned, we don’t have a dresser nor do we have room for one so we must rely solely on baskets and shelving! 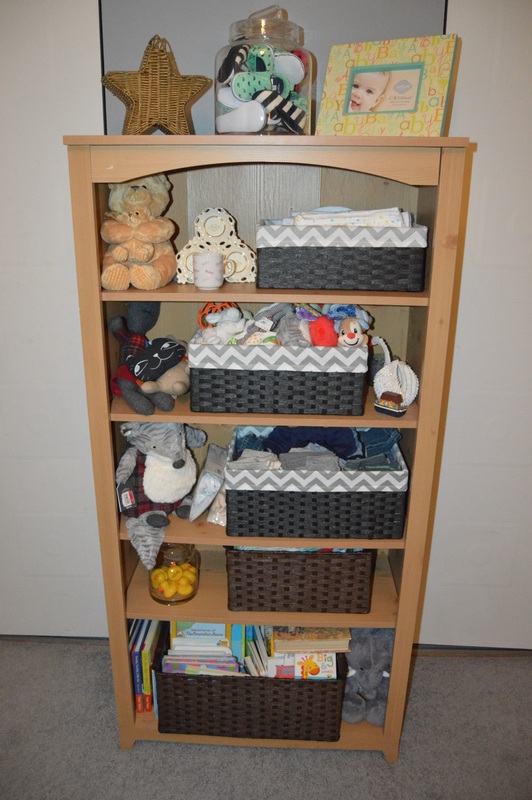 Here’s our former bookshelf/collect-all turned baby storage. 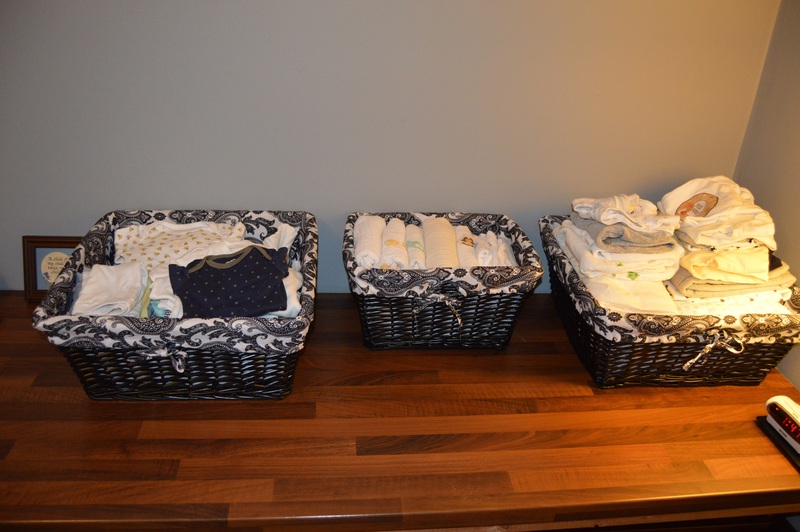 I purchased the grey chevron baskets at Kohl’s a few months back and the brown baskets were given to me at my shower! Lots of little goodies shoved in the baskets from bibs and burp cloths, to rattles and teethers, larger clothes and jeans, washcloths/towels, and loads and loads of books! The cute little grey cat on the second shelf was also a handmade up-cycled item from another one of my VERY creative cousins and the little beige creature next to it as well. Canisters came from Macy’s and Star basket came from a second hand store in Ocean City over the summer. The closet looks like a hot mess but it really is pretty organized. The top is stuffed with diapers and wipes. Anything over a size 3 we’re storing at my parents house for now. Hamper was a very early purchase as well at Kohl’s for mere pennies! The changing pad and crib wedge are also stored here so Zoe doesn’t ruin them (oh wait, she already put her nails through the changing pad!). I have three matching Baby Things baskets from my shower which fit nicely on the shelf we installed from Walmart. 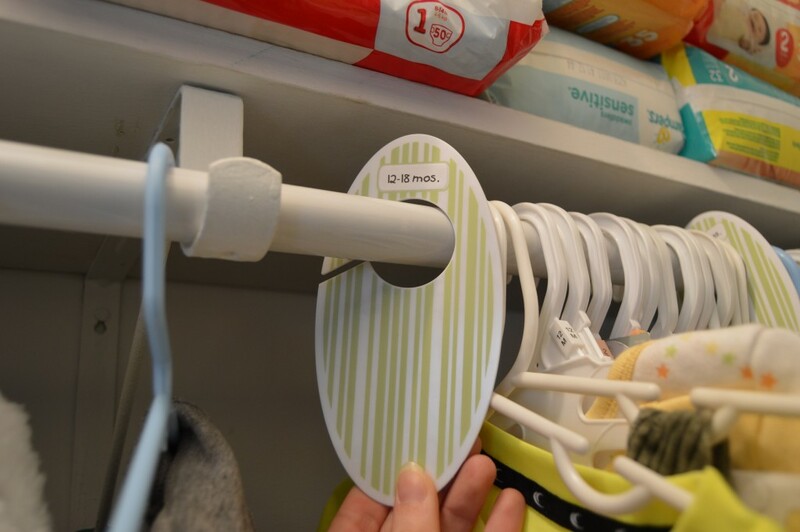 Clothes are hung by size with these clothing size dividers! 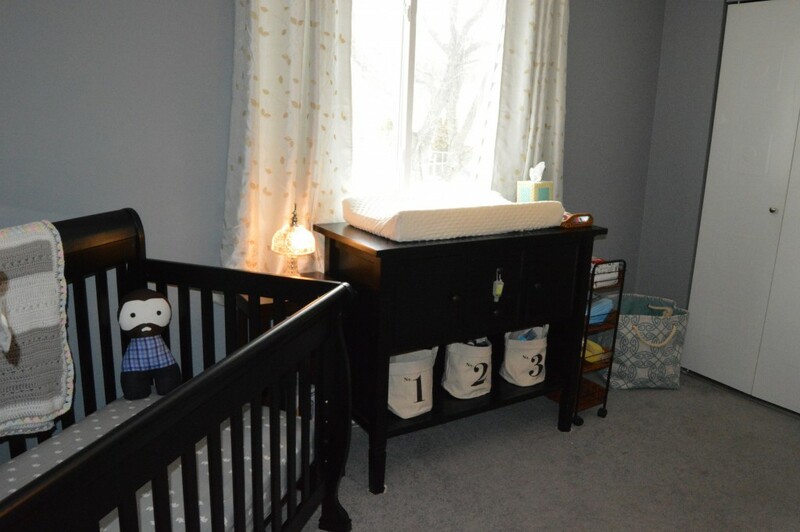 I really like how everything has turned out in the nursery. I feel like we started early enough so that we could enjoy the experience and not feel rushed. A little at a time is what wins the race. Luckily, my Mom could come down and help finalize some of the organization when I felt a little overwhelmed with it. We have a few more things to find homes for. 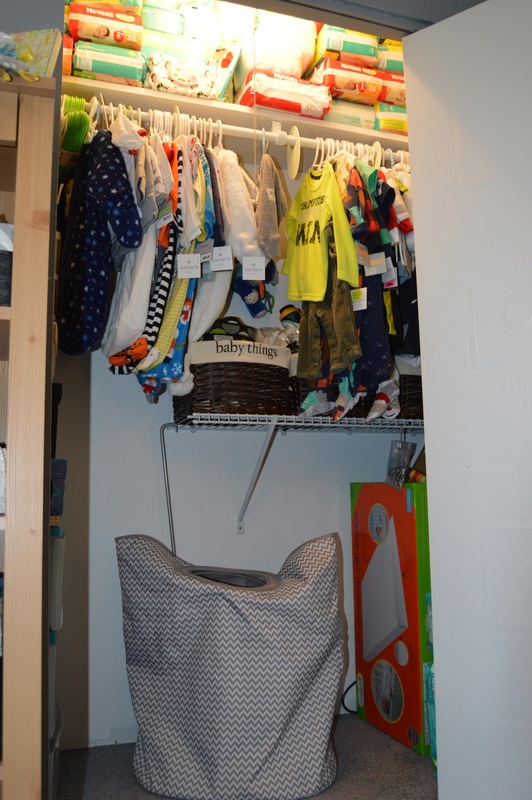 Obviously we have a swing, bouncer, pack-n-play, high-chair, stroller and a couple car seats spewed around the house but no need to see that clutter just yet! Kevin installed the bases into both vehicles…now we just wait! This entry was posted in Uncategorized on February 18, 2015 by Danielle Laroche. Love love love IT ALL!!! Great job!!!! It’s beAutiful!!! !